For the first time since the Green Revolution, food and fuel commodity prices began to rise in 2001 and reached peak levels in 2008 (FAO 2008; Peters et al. 2009; Trostle 2008a, b). As primary food commodities (e.g., corn, wheat) doubled in price, the biofuel industry expanded manifold within this same period (e.g., ethanol from corn and sugarcane doubled to 65 billion liters; biodiesel from soybean, oil palm, and rapeseed reached 12 billion liters or six times 2001 levels (Martinot and Sawin 2009). Popular opinion has linked biofuel production to the shock in food prices in 2008. 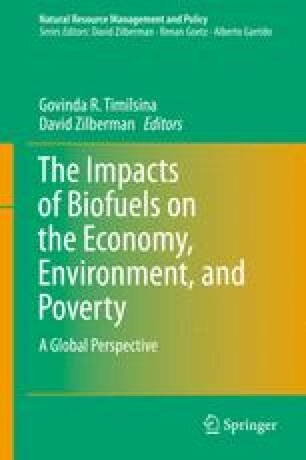 Yet, much of the biofuel demand by the US and EU was driven by government mandates and subsidies, which aim to reduce the demand for oil and increase demand for agricultural goods (Hochman et al. 2010). In high-income households and countries, a smaller percentage of crop prices is reflected in the final food price (due to food processing, packaging services). In low-income households and countries, however, crop prices have much larger share of the final food price.